The Group adjusts to the presence of Merle and Michonne in the prison. 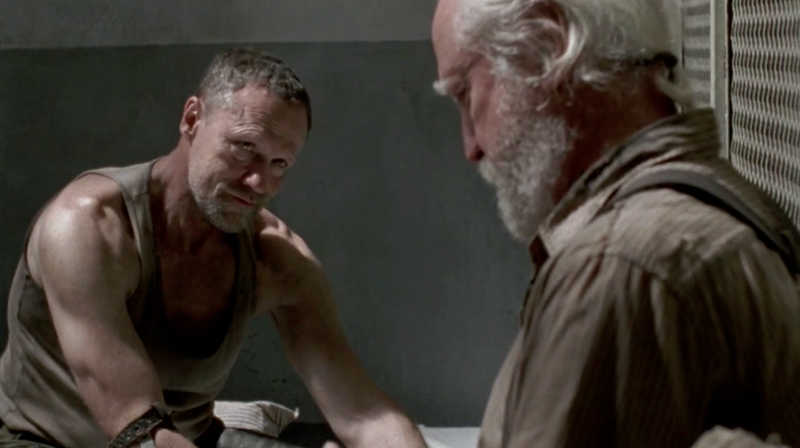 Merle makes the effort to over an awkward apology to Michonne; seeming not to notice when she compares him to a member of the Nazi Gestapo. 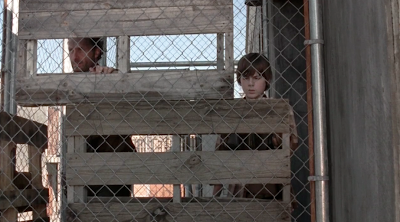 Carl and Maggie keep watch when a surprise visitor arrives at the gate. 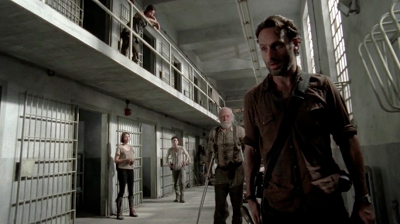 Traveling with a pair of captive Walkers, Andrea has made her way to the prison. 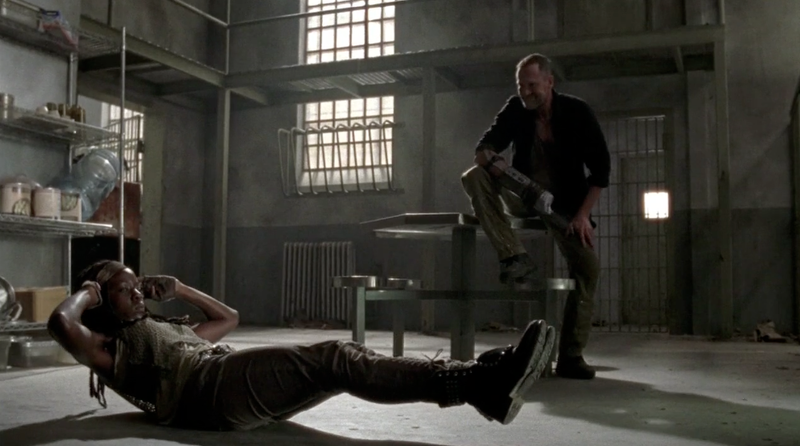 She is met with suspicion as Rick searches her and seizes her weapons. 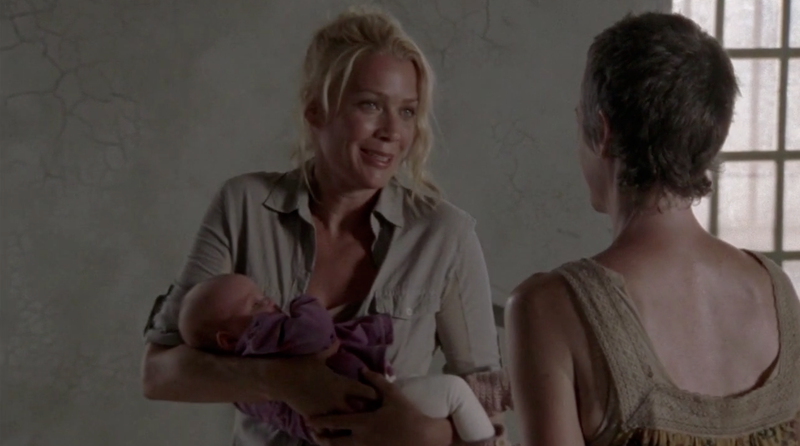 Once inside the cellblock, only Carol greets her with any warmth and the two embrace. Andrea is horrified to see Hershel's injury and learn of the deaths of Shane, Lori and T-Dog. 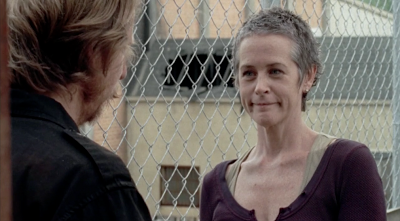 She warns them that the Governor is raising an army and that he intends to fight them. Rick refuses to acknowledge her warnings and instead tells her that they will kill the Governor. 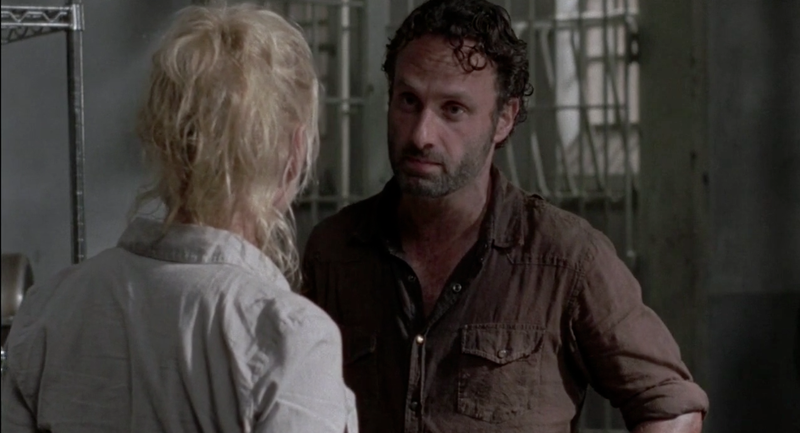 The Group also refuses to waver as Andrea pleads with them to make peace with the Governor. 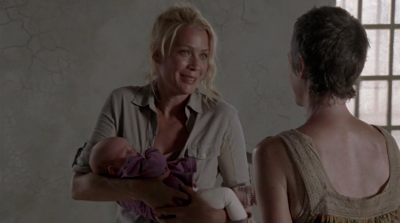 Even Carol privately urges Andrea to give the Governor the greatest night of his life and then "end this" while he sleeps. The reunion has not been productive and it ends as Rick provides Andrea with a car and returns her weapons. She drives away sadly as the Group looks on. 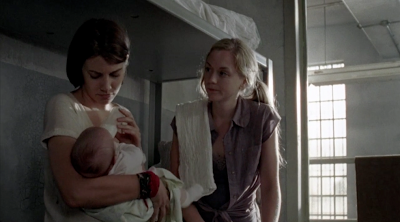 Despite the extra mouths to feed; Hershel would have been adamant that Andrea share a meal with them before she left. 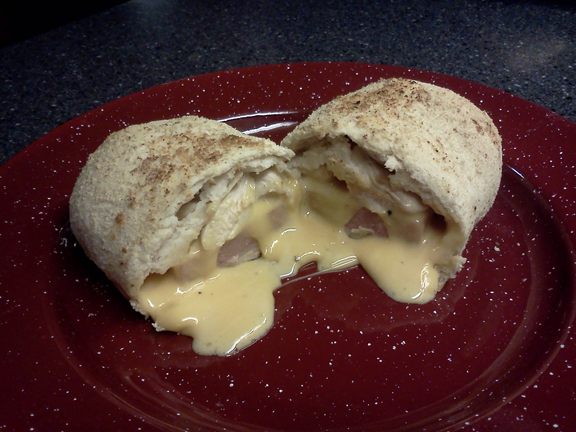 Canned meats and shelf-stable cheese, along with a pastry-crust mix, can be combined into a quick and pleasing version of Chicken Cordon Bleu. The comforting flavors of chicken, ham and cheese will remind your group how much you care. 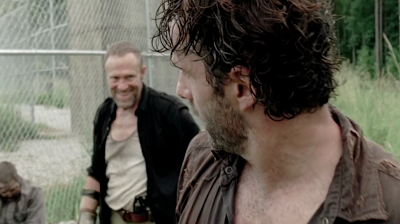 And when the dead rise; never trust one of Andrea's boyfriends. 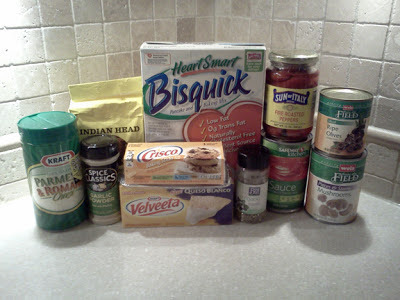 In a large bowl, combine the baking mix, garlic powder and water. Blend well with a spoon until the mixture forms a ball of dough. Divide dough in half and then divide each half in half again. You should have four equal pieces. 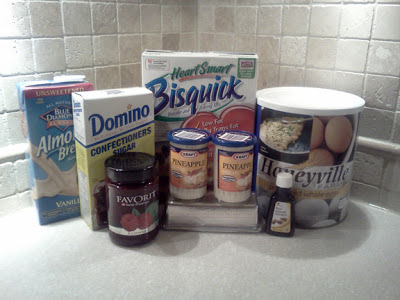 Sprinkle baking mix onto a flat, clean surface. Roll each ball of dough in the baking mix and pat out each into a 6 by 4 inch rectangle. Place a slice of SPAM lengthwise down the center of each rectangle. Place one slice of cheese on top of the SPAM. Top each slice of cheese with chicken meat, dividing evenly. Fold the shorter sides of the dough rectangle in towards the meat/cheese mixture. Hold in place while you roll up the dough (jelly-roll style) carefully to enclose the filling. If any of the dough tears while rolling, simply pinch together and reseal. Place onto greased baking sheet or in greased cast-iron skillet. Repeat the process with remaining dough, meat and cheese. Melt butter-flavored shortening and brush over each dough bundle. Sprinkle each bundle with bread crumbs. Place baking pan or cast-iron skillet into preheated oven and bake for 15-20 minutes or until golden brown. Alternately, place bundles in a cast-iron skillet cover tightly with aluminum foil or a baking sheet placed on top of skillet. Place over campfire coals. Allow to "bake" for 10 minutes and check. Bundles should be golden brown and sound hollow when tapped. If needed, reseal with foil and continue to bake for another 10 minutes. The Group continues to debate the merits of staying in the prison versus survival on the open road. The addition of Daryl's brother Merle to the Group causes even more stress. Merle's abrasive nature does not endear him to anyone, particularly Glenn. 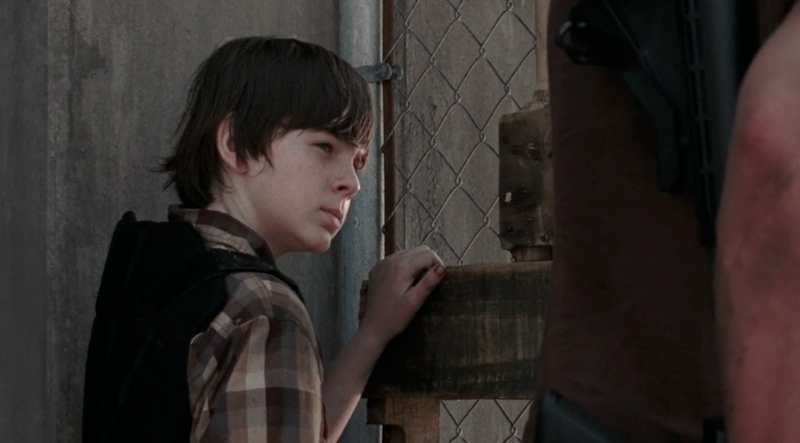 Even Carl senses the enormous strain on Rick and urges him to allow Hershel and Daryl to carry the burden of leading the Group. Merle warns Hershel that the Governor is a born killer and will not rest until they are all dead. The older man does his best to smooth tensions within the prison. Despite the near-constant internal conflicts, Hershel would have insisted that they all sit and eat together. Although Glenn believed their food to be in short supply, with a little ingenuity, even the most dull looking ingredients can be transformed into a Southern Specialty. 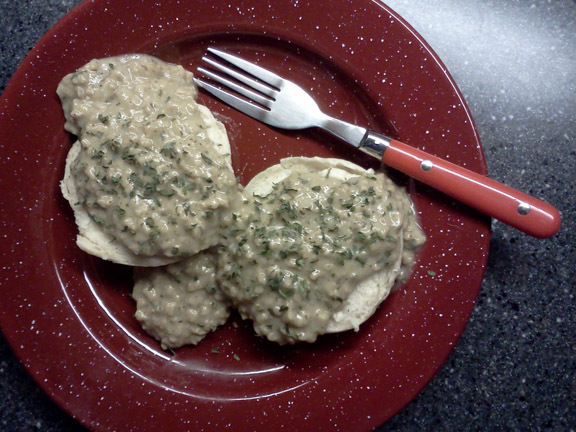 Sausage Gravy and Biscuits (a traditional breakfast in the Southern United States) is a substantial meal; just right for fueling a day of hard work. The gravy makes excellent use of TVP (texturized vegetable protein) as a stand-in for pork sausage. Perfectly spiced, this comforting classic will smooth over even the most frazzled nerves. And when the dead rise; and even your kid thinks you need a mental health day…take one! In a heavy saucepan or Dutch oven, combine the TVP, stock and all the seasonings (including optional ingredient if desired). Heat the mixture over medium heat or medium-hot campfire coals. Allow to cook for 15 minutes or until the TVP is softened and the stock is absorbed. Melt the butter-flavored shortening in a large cast-iron skillet over medium heat or medium-hot campfire coals. Add the flour and cook, stirring constantly for 3-4 minutes. Stir in the milk and bring mixture to a simmer. Stir the skillet constantly, using the spoon to scrape the bottom of the skillet so no flour sticks and burns. Cook for 5-6 minutes or until mixture is thick. Stir in the seasoned TVP mixture and blend well. Add sea salt and pepper to taste. If the mixture is too thick, you may add additional milk or water (a tablespoonful at a time) until you reach the desired thickness. Serve over split hot biscuits and sprinkle with parsley. Serve immediately. 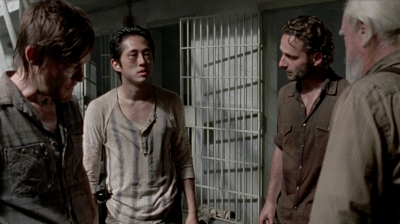 Glenn returns to the Group's cellblock with the dire news that the corridors of the prison tombs around the boiler room have been overrun by Walkers. He wants to take a car to scout the outside of the prison and determine how the Walkers are getting in. 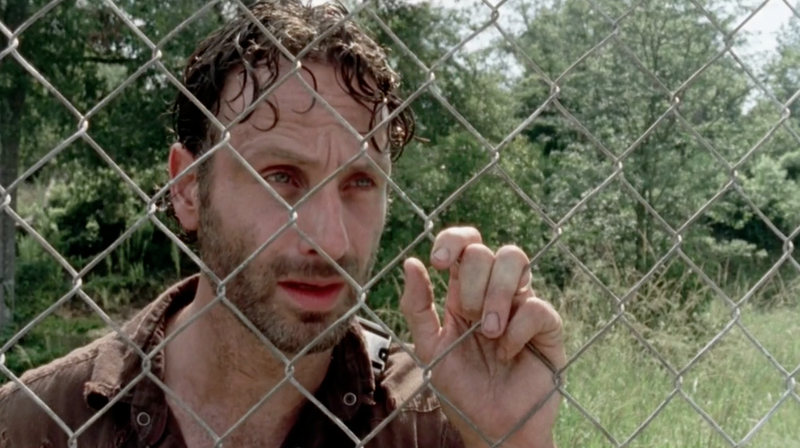 Rick still wanders aimlessly around the prison grounds. 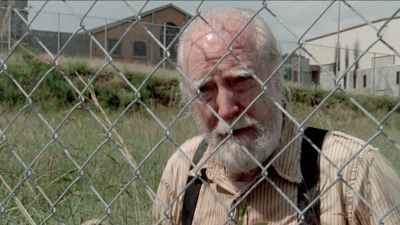 Hershel calls him over to the fence to talk. 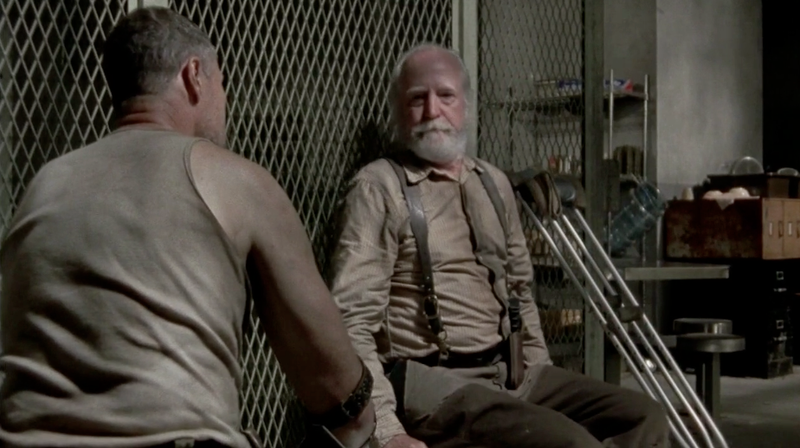 The old man offers his help and Rick confesses that he has seen Lori and Shane. Axel and Carol watch Rick wander and Axel discusses how stress affects a person. He starts to tell Carol a story about his brother when gunfire erupts and he is killed instantly. 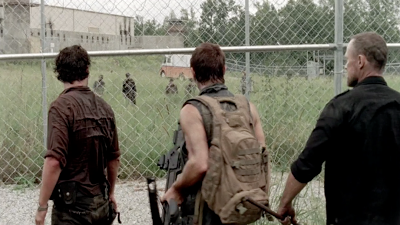 The Governor and his men have arrived and they open fire on the prision. The entire Group is separated and pinned down. A delivery truck rams the main gate and enters the outer perimeter. Emerging from the truck, a masked driver releases a small herd of Walkers. The once secure area is now overrun and the Group is swarmed. 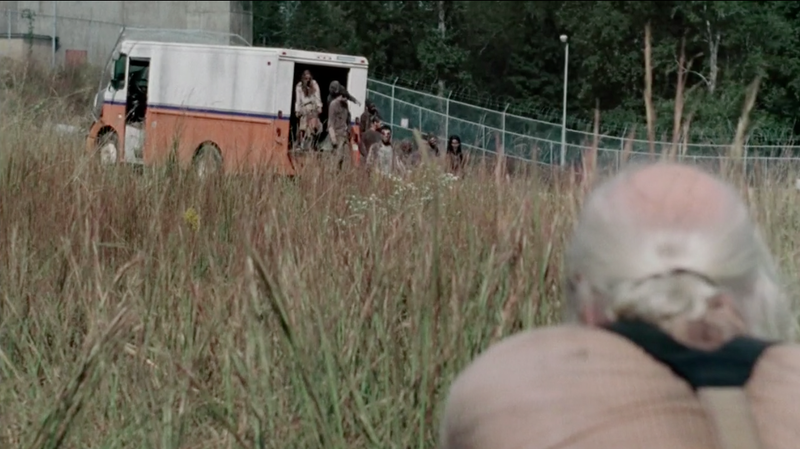 Rick tries desperately to fight his way in but the sheer number of Walkers makes it impossible. 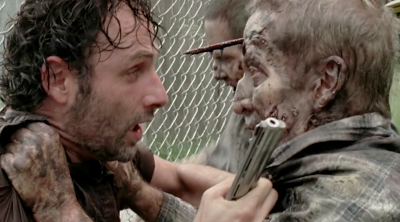 All hope is almost lost when Daryl and Merle Dixon appear from nowhere and beat back the swarming herd; saving Rick's life in the process. The Group has gained two fine fighters and lost yet another member. The prison yard is overrun once again and the Governor is still at large. 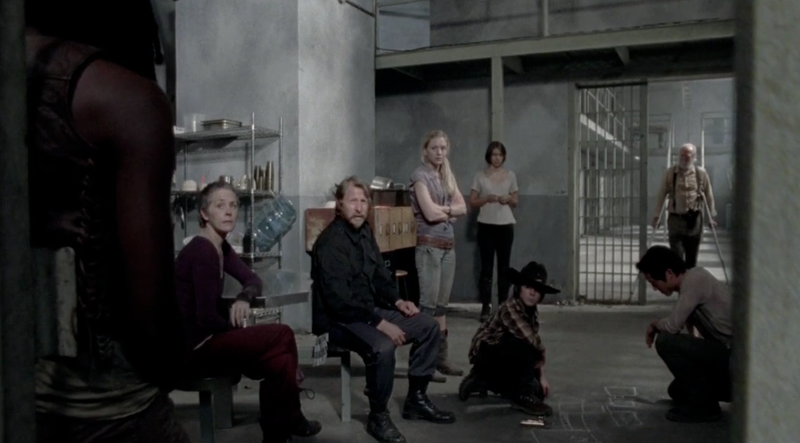 Hershel would not have allowed the Group to simply stand and stare at the heartbreaking sight. He would certainly have forced them inside for their evening meal. Despite its seeming impossibility, a delicious pizza can be put together from pantry ingredients. A Parmesan and garlic crust forms the base and jarred olives, mushrooms and roasted red peppers and shelf-stable cheese top this unexpected treat. And when the dead rise; if one of your group turns out to be good with a sword…whatever you do, don't make them sleep in an overturned bus! For the Sauce: In a small bowl, combine tomato sauce and oregano. Stir until blended. Set aside. For the Crust: In a large bowl, combine baking mix, cheese and garlic. Stir in 3/4 cup of hot water and blend until a moist dough forms. If needed, add the additional 1/4 cup water. Sprinkle a clean, flat surface with a few tablespoons of baking mix. Turn out dough onto surface and knead gently 5 or six times until dough's surface is smooth. Place dough onto prepared pan and pat out into a 12 to 14 inch circle. 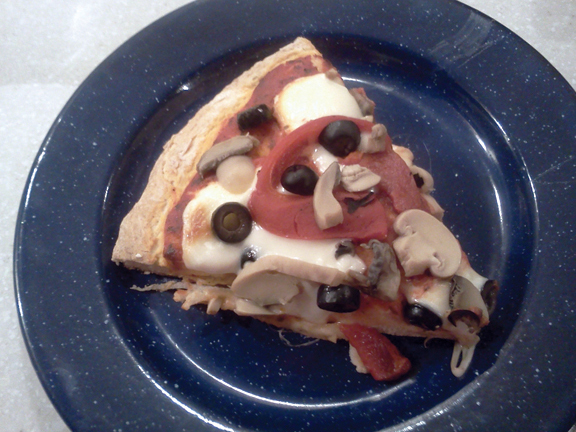 Top with 1/2 cup of sauce mix and spread sauce to within 2 inches of edge of crust. Top with sliced cheese and slices of roasted red peppers. Sprinkle with olives and mushrooms. Bake in preheated oven for 22-25 minutes or until crust is golden and appears dry and cheese is melted. Alternately, cover baking pan with aluminum foil and place over grill over campfire coals. Bake for 10 minutes and uncover to check. Rotate pan if necessary to ensure even baking. Reseal foil and bake for another 5-10 minutes or until crust is golden and cheese is melted. The next morning, Rick stands on guard duty. 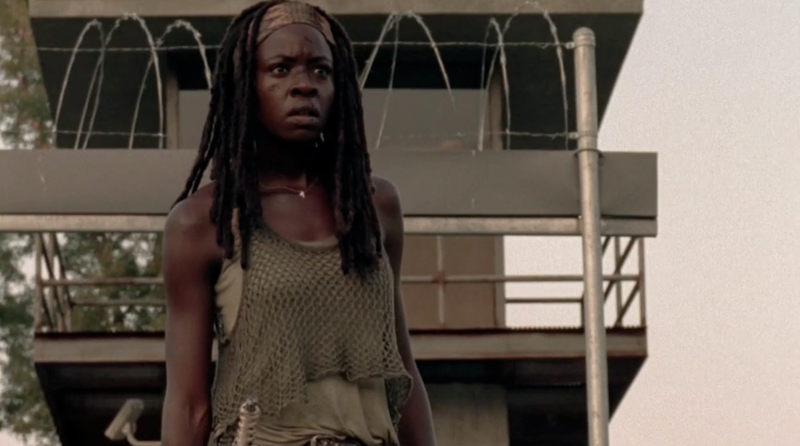 MIchonne, being confined to an overturned bus in the outer prison courtyard, notices him running towards the makeshift graveyard for the Group. She then watches as he races to the small bridge beyond the graveyard. She puzzles as he gestures in the air. Later during a meeting with the Group, Michonne assures them that the Governor and his men will return. Glenn insists that they must return to Woodbury and kill the Governor. 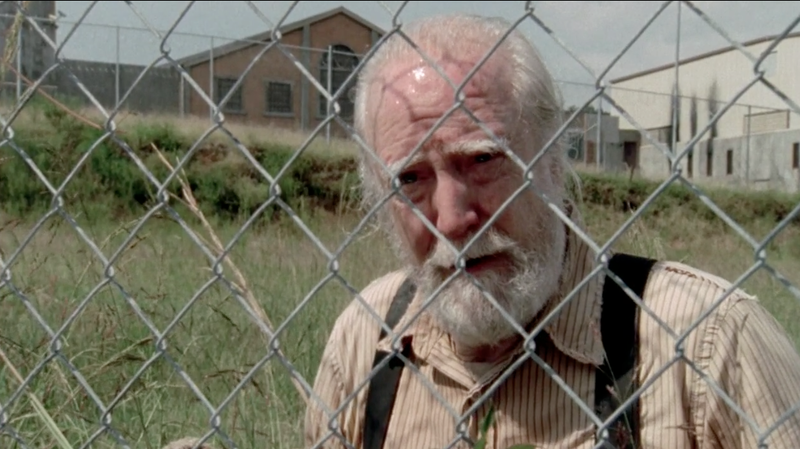 Hershel wants to abandon the prison and return to the open road. 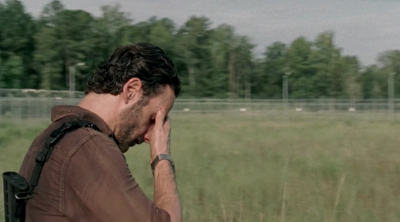 They do not consult Rick on any of their discussions to protect his fragile mental state. Carol and Axel use empty pallets and sheet metal to reinforce the prison catwalk against attack. Axel reveals that his prison sentence was for robbery with a water pistol. 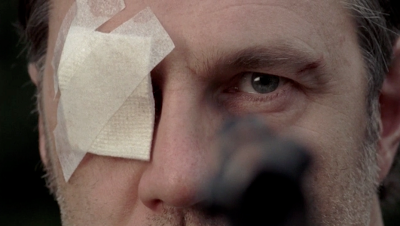 And he knows nothing about the weapon they have given him. 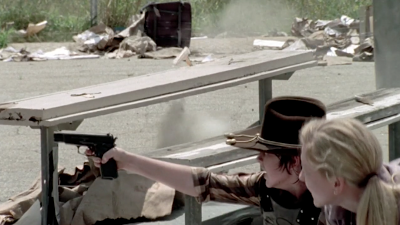 Carol gives him a brief tutorial as they finish their task. Beth wanted to prepare breakfast for Hershel and the Group. It had to be something fast because they had no time to spare with all the work clearing the lower prison levels of Walkers. 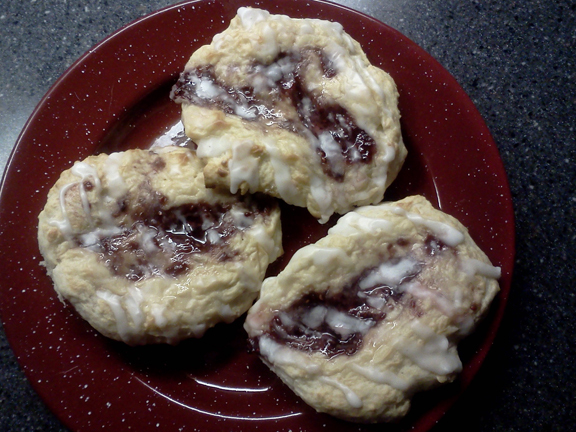 Raspberry Cheese Danishes taste like they came from your favorite corner bakery (before the Zombie Apocalypse of course) but can easily be assembled from pantry ingredients. Even better, the Danish are portable and can be taken along for any chores your group may have. And when the dead rise; don't let anyone in your group wander Crazy Town. 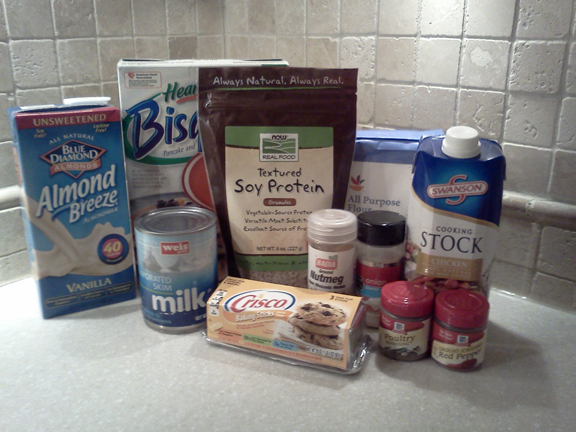 In a large bowl, combine the baking mix, butter-flavored shortening, sugar and milk. Stir until dough forms but do not over mix. Let batter rest while you preheat oven to 450°F or allow campfire coals to burn until they are covered with white ash. In a smaller bowl, combine pineapple cream cheese spread, egg mix, sugar, milk and almond extract. 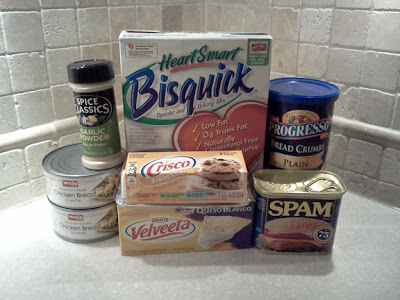 Grease a 9" x 13" baking pan, jelly roll pan, or cookie sheet with shortening. Using a large tablespoon, drop batter mix by large rounded tablespoonfuls onto greased pan. Using clean, greased hands, make a well in the center of each. Drop a few teaspoonfuls of the cream cheese filling into each well. Follow with a few teaspoonfuls of the raspberry preserves. Swirl them together with the back of a spoon if you wish for a marbled effect. Repeat until all the dough and filling is used. Be sure not to space the dough drops too closely as they will flatten and spread out upon baking. Bake in preheated oven for 10-14 minutes or unit tops spring back lightly when touched and the cheese mixture appears cracked. Alternately, cover baking pan tightly with foil and "bake" over preheated campfire coals until the dough is golden and the cheese mixture appears cracked. Allow to cool while preparing glaze. In a small bowl, combine powdered sugar and milk. Blend until smooth. After danishes have cooled, drizzle with glaze. Serve immediately.